Christ Church New Jersey v. Rockaway Township. The Becket Fund for Religious Liberty (n.d.). Retrieved from https://www.becketlaw.org/case/christ-church-new-jersey-v-rockaway-township/. Christ Church New Jersey v. Rockaway Township. (Apr. 04, 2019). https://www.becketlaw.org/case/christ-church-new-jersey-v-rockaway-township/. "Christ Church New Jersey v. Rockaway Township." The Becket Fund for Religious Liberty. Accessed [Apr. 04, 2019]. https://www.becketlaw.org/case/christ-church-new-jersey-v-rockaway-township/. Cramped—that’s how members of Christ Church felt after an exhausting seven year search for a new house of worship. In less than twenty years, a home Bible study of eight people had grown to a church of more than 5000 members. Their 800-person sanctuary was bursting at the seams; it couldn’t keep pace with the needs of a rapidly expanding congregation. In April 2003, the Church signed a contract to purchase a large property from a bio-tech firm in Rockaway Township, New Jersey. It seemed like a perfect fit. 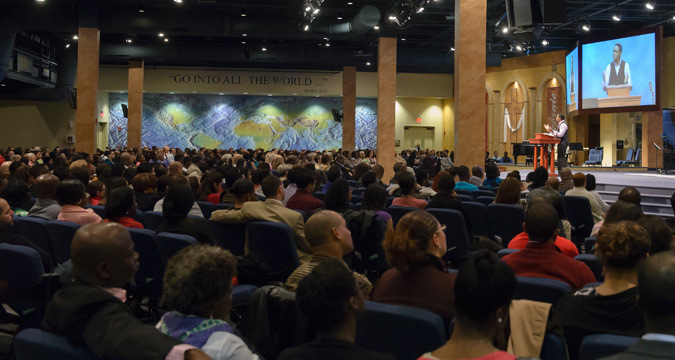 Conveniently located just 21 miles away from the Church’s primary campus in Montclair, the new facility could seat over 2,500 people, every service. But when Christ Church requested approval for its site plan from the Rockaway Township Planning Board, local officials actively sought to block construction. Although couched in terms of concerns about traffic and congestion, there were also indications that some of the resistance came from the fact that Christ Church’s membership was diverse, and its Senior Pastor, Rev. David Ireland, was African-American. Becket stepped in to advise Christ Church and counter the city’s attempts to drag out the approval process. City bureaucrats sought to foment local opposition, and even went as far as to question whether Christ Church was, legitimately, a “church” as defined by city regulations. Rockaway Township, observed Derek L. Gaubatz, Becket’s former director of litigation, tried “to hunker down and throw sand in the gears at every step of the process.” In a private meeting with Rev. Ireland, the Mayor of Rockaway said “we don’t want you here,” and threatened to seize the property by force of eminent domain. On April 15, 2005, Christ Church filed suit against Rockaway Township officials for placing unconstitutional, discriminatory burdens upon its right to pursue its religious mission. The Religious Land Use and Institutionalized Persons Act (RLUIPA), the federal statute that supplied the core of Christ Church’s claims, shields religious institutions from the imposition of land use regulations which place them “on less than equal terms” with nonreligious assemblies. Local officials did just that. Rockaway Township did everything it could to create an antagonistically unequal playing field for Christ Church. After two years of litigation, the Rockaway Township Planning Board relented, settled out of court, and in October 2007, granted Christ Church approval for the construction of its interim sanctuary. The church celebrated receiving its final Certificate of Occupancy on June 1, 2009, six years after buying the property.